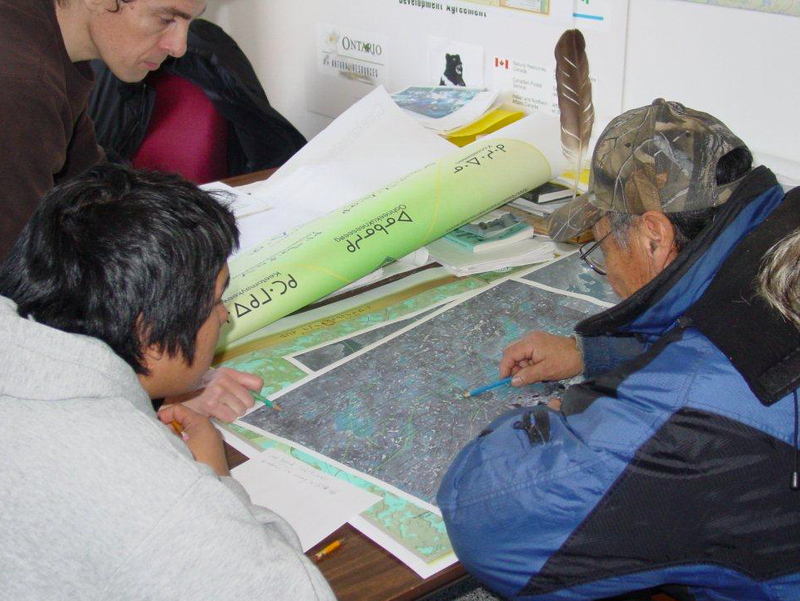 Michael O’Flaherty (top left) working with late Pikangikum elder Jake Keejick (right) and Reggie Peters (left) to record knowledge of caribou habitat. Offering documentation of cultural and ecological values associated with the land through both interviews and field studies. Geo-referenced data is archived in a digital data base that can be used for analysis and mapping. Training can be provided for community researchers to work on interviewing, field work, database creation and maintenance. Maps of geo-referenced data can be printed in large format and packaged as Acrobat pdf files for sharing. Maps can be used to illustrate contemporary land use, historical occupancy, or knowledge of particular species, among other uses. Images and illustrations produced in the community can be incorporated in maps.